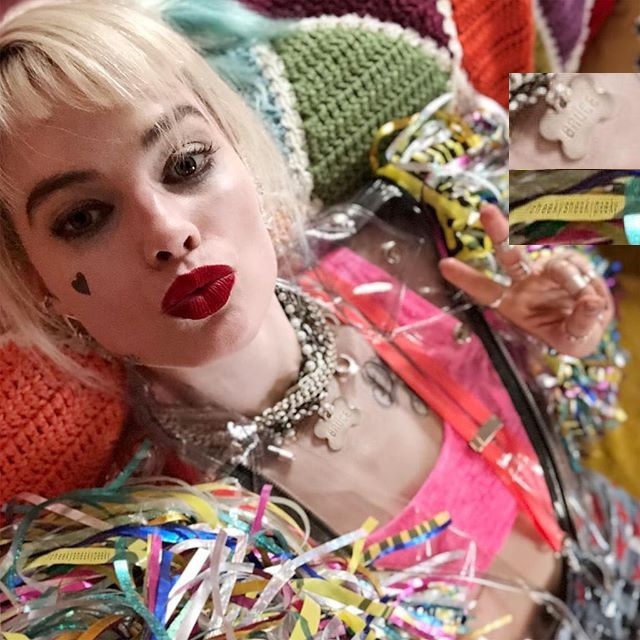 Robbie Margot just released a 'teaser teaser' of the Birds of Prey movie, or Birds of Pre (and the Fantabulous Emancipation of One Harley Quinn) movie. Now the odd thing about this picture is the "dog-tag" Harley Quinn is wearing. Look at the name in it. It reads "BRUCE". Now the sites are on a frenzy speculating if it means BRUCE WAYNE, as in aka BATMAN, or BRUCE TIMM, aka one of her co-creators. They're leading more on the former, because there's no "PAUL" anywhere, as in aka PAUL DINI her other co-creator, and some sites are even coming up with rumors that Harley and Bruce are now a couple in the DCEU. I just don't know what to tell you every time I see something DC related I feel tired. It may be due to the fact that in my mind DC should be doing better. DC has some of the best stories and characters yet this is the best they can do. I just feel so let down and disappointed by DC sometimes, what the hell happened? But to comment directly on Birds of Prey. I am not impressed. The entire premise is baffling, to begin with, why not Gotham City Sirens? Why is the roster so weird? But most of all why aren't the costumes comic book accurate? I mean they don't need to be 100% accurate but they seem so lazy and relax don't like it. You know what ? I'd love this to be true only because of the hilarity that would no doubt ensue as a result. I've said before that I never understood the reasoning behind turning Catwoman into Batman's one and only, solely based on the fact that both characters have had tragic pasts of some sorts as that's such a weak reasoning for a relationship as Gotham is full of characters with tragic pasts. What makes Catwoman anymore special than Poison Ivy or Harley ? That's why I hate this narrative that DC and many rabid fans have created about how "special" Catwoman is, when there's really nothing unique or special about her or what she means to Bruce beside what the shippers insist on. To that end, I've been hoping to see other characters appear and challenge that whole idea, but DC seems smart (or stubborn) enough to realize how dangerous that would be and so they've seen it fit to basically prohibit Bruce from forming any sort of meaningful relationship with any female character not dressed in a catsuit. Now that the background information is out of the way, what do I think of the possibility of a Bruce/Harley romance in the DCEU ? Well I don't think it's all that likely that this is anything but an easter egg, especially since I don't think Batman will be making any appearances in Birds of Prey or anything else. So whether the name on the dog tag refers to Bruce Wayne or Bruce Timm, I don't see it affecting the movie either ways. I'd imagine the idea of Harley hooking up with Bruce to be big enough to need addressing in the movie, especially since last we've seen of her, Harley was nowhere near Bruce. Also, the Suicide Squad movie made a point of mentioning that Harley helped kill Robin, so I imagine any redemption she could have will need a lot of explaining to do, especially if she's on a first name basis with Batman. So in short, no I think it's highly unlikely that this is hinting at Harley and Bruce having anything together. HOWEVER, it IS an interesting idea to speculate about. Margot Robbie has proved herself both savvy and shrewd when it comes to matters relating to comics. She's really working hard to make her Harley gig into the biggest thing possible. You can see that with how she's chosen to go with a Birds of Prey movie and place herself in the spotlight, rather than share it in a Gotham City Sirens movie. I also distinctly remember her posting a picture of herself with a stack of Harley related comic books, with the most visible one being the valentine issue that Harley shared with Bruce. So I can definitely see Robbie trying to steal Catwoman's spot as Batman's love interest away, I mean she's already done the same to Barbara. I can totally imagine the kiss that Harley shared with Batman in Suicide Squad being Robbie's idea. She really wants to make Harley into the biggest DC female character, and this could be her next step. I mean it worked for Catwoman for all these years and she basically has nothing going on for her otherwise, so I'm sure Robbie sees how beneficial having Batman in her pocket would be. But that's all speculation. Bottom line is, this sounds like something Robbie might push for, but I think it would be very difficult to pull off considering the circumstances, but I'd love to be proven wrong, Anything that throws a wrench in BatCat is always welcomed in my opinion. I’ve not been a fan of Birds of Prey including Harley or Ivy. They are villains and should remain that. Sirens is find. And I’m fine with Catwoman walking both. But to me the Birds of Prey is more Black Canary, Oracle, Huntress at the least. Birds of Prey isn’t just women. Theyre basically the Batclan that operates more on the East End and bring a more different perspective. The Batclan is usually led and consists of men marred by tragedy. Gotham is their way of trying to fix those issues. Birds of Prey have their own fair share of tragedy, but they’re also different, which goes with the masculine and feminine contrast between the Batclan and Birds. Batclan is masculine in answering the problem with scorched earth. Bruce throwing the might of his wealth and resources along with his anger and desire for vengeful Justice at full force. The Birds though, are women who attempt to respond to the tragedies in their life by making things right. Sure in some continuities Helena or Kate are rich, but there’s still almost something street level or garage start up about their operation.